Holly Vault will surprise you. Before I knew what it was, I had walked by this building numerous times, but once you enter this historic venue, it is filled with treasures - from vault bar to lovely reception space to rustic mixed with modern. 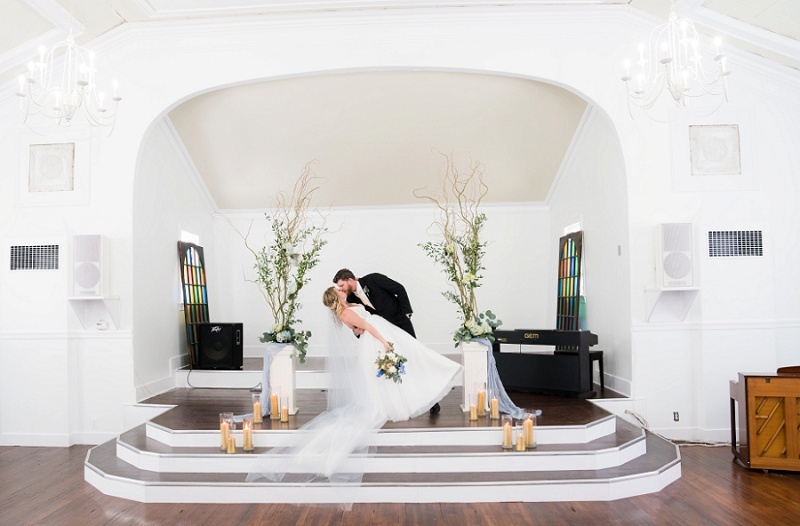 And now just a few blocks away they have added a Chapel - beautiful white chapel that can be used as blank canvas to become anything you want for the wedding day. 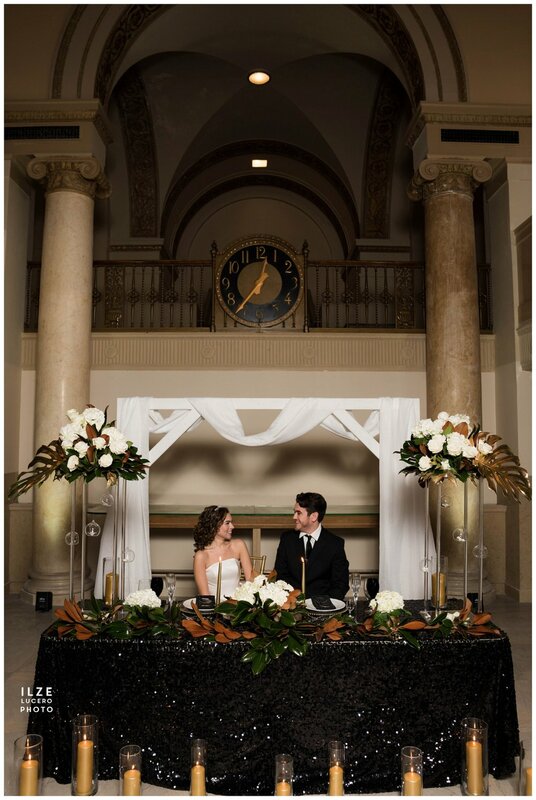 The Treasury in Pontiac is is a stunning historical venue - it used to be a bank and still has a vault with safe deposit boxes tucked downstairs and an impressive clock right on the balcony made me think of Cinderella. Planning and wedding flower arrangements provided by Design Quintessentials , planning and cake by The Dulce Experience, lovely dresses from Pas De Deux Bridal and Dolly Couture Bridal , jewelry by Anuja Tolia, and accessories by Elizabeth’s Bridal Manor, as well as the linens and draping from Luxe Event Linen. Out lovely models were styled by talented hairdressers Stephanie Stearnes Artistry and Simona Vigh Hair Design and MUA Make-up by Rosa. Our photo shoot was even featured in Wedding Day magazine. I love to capture movement, to see the swaying, the flow of fabric, the way body goes through the motion. I love the bride dances - first dance, or just the joy of twirling. If I would have to describe modern Detroit wedding - this one was it. From the couple getting ready at RenCen, to first look on the River walk, to creative photos around iconic Detroit places, to the wedding celebration at Waterview Loft at the Port of Detroit, to amazing fun filled matron of honor speech / song story of couples love in Motown songs. These kind of weddings is why I love being wedding photographer. Also check out their amazing engagement photos at DIA. Waterview Loft at the Port of Detroit is one of my favorite venues. The lower level right on river walk of Detroit River is perfect with large garage door windows serves as ceremony space that gets transformed for cocktail hour and later dancing, and upper level host lovely reception space overlooking Detroit River. I have been looking forward to this wedding from the time I met the couple and their amazing engagement photo shoot at DIA. And the big day was filled with laughter, love and joy. I love engagement photo shoots. I get to know the couple better before the big day, and quite often I get to meet their four legged friends. If I could give one tip for couples who want to incorporate their pets, make sure you got some helping hands. Most of the time the pet is with a friend or the family member for part of the photo shoot. Sometimes the furry family member is at another location and we stop there for a bit. For this engagement photo session we started with just the couple at the park and concluded with stop at home where and adorable puggle joined us for some cute photos in the neighborhood and the yard. Grosse Pointe Yacht Club is a beautiful venue with great architecture - perfect for a wedding. On this beautiful day filled with sunshine, bride and groom celebrated they big day with friends and family, and a lot of nieces and nephews and their dog. After the emotional first look, their beautiful German shepherd posed for wedding photos. In Wedding Tags Detroit wedding, detroit wedding photographer, wedding photographer, grosse pointe yacht club wedding. Indian Springs Metro Park is one of my favorite local Clarkston locations for photo sessions. We went exploring for this fun family photo session starting at Nature Discovery Center through paths in deep grass, up the hill and overlooking the beautiful area. The pond glistening behind us. This location has so much to offer when it comes to photography and it is a great place to take kids exploring and running, and having fun. We didn’t get to see any wildlife this time, but I have seen bunnies and listened to lovely birds singing. Depending on the season you choose to visit and explore the area, I suggest bringing bug spray in summer seasons, since the park has tall grass and several ponds… and , yes, quite a few mosquitoes. This photo shoot was so much fun - creating beautiful portraits in lovely locations. 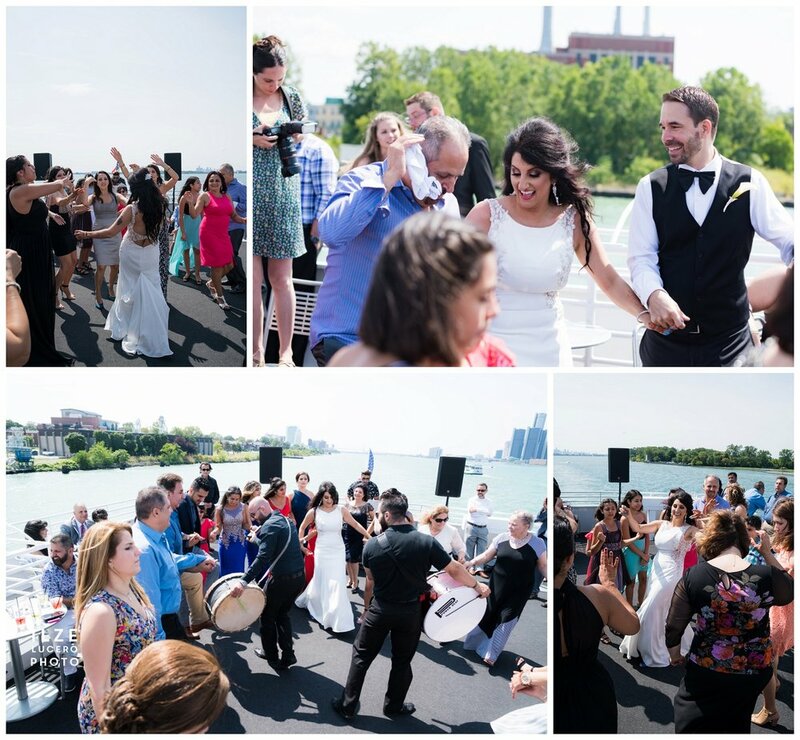 At this Iranian American wedding on Detroit river drums and dancing filled the Ovation Yacht as the couple started their wedding journey. We started on lake St Clair Beach with a first look and some bridal party photos and then headed onto Ovation Yacht. As the yacht departed the port drummers brought guests and bride to the deck for the grand entrance and the ceremony. I love seeing cultural traditions at weddings as families blend and start new journeys. As we approached Ambassador Bridge, couple started their first dance. Belle Isle Yacht Club is amazing wedding venue. This wedding had a stunning sunset, after quite rainy day. This engagement photo shoot on Belle Isle was filled with laughter and love. The brides hair in long locks made me think of Rapunzel or Sansa from Game of Thrones. And the couple was so smitten and fun and made me love my job with every photo we took . I love photographing on Belle Isle with ton of great locations around the park. Weeping willows create romantic setting as we explored the area near ponds and conservatory. Belle Isle is a plentiful photography location, but make sure you get your permit, as park staff will be asking to see it. After fun on Belle Isle we concluded out engagement photo shoot at the Ouizi floral mural on Agnes Street - another of my faves in Detroit . First look is my favorite moment at the wedding - first time the bride and groom see each other dressed and ready is one of those amazing moments when the rest of the world falls away. It doesn't matter when it happens - at the altar, or before the ceremony. Having first look before the ceremony also allows the couple to schedule formals with the bridal party and family as well as creative couples photos right after, especially if the couple chooses to mingle with guests at the cocktail hour. This also allows more time flexibility for creative and formal photos in case there is large bridal party or couple is traveling to different reception site. Seeing each other for the first time without all of the guest, also allows for more fun in the moment. No one is is waiting to start the ceremony. Its just fun time to connect. 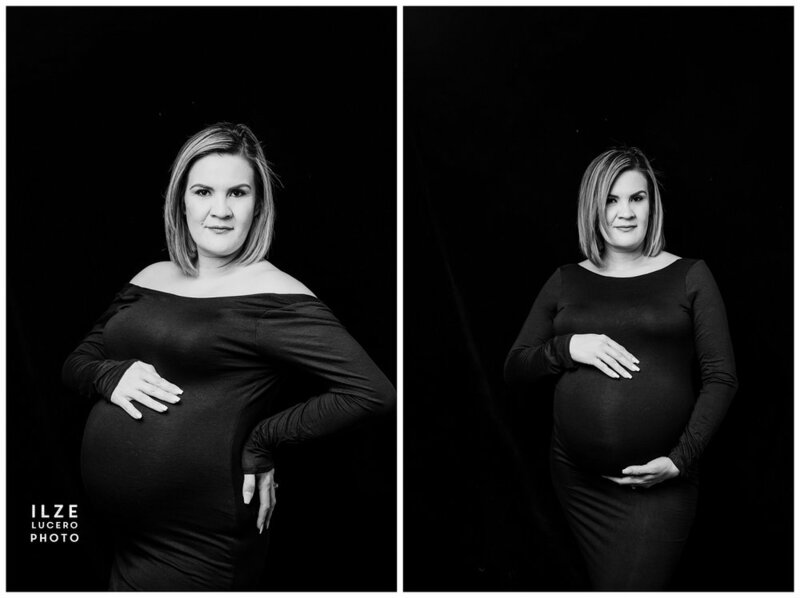 So here it is - my 3 reasons to have first look. I notice more and more couples choose the First Look instead of seeing each other for the first time at the altar for variety of reasons. But no matter when bride and groom see each other first - it truly is a very special moment.